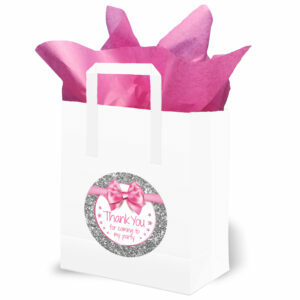 Pack of 10 Party Bags with Handles. Each bag measures Approx 175mm wide x 210mm high x 70mm deep. They come with 10 large round stickers (95mm Diameter) to stick on each bag and 10 sheets of pink tissue paper. The stickers have the text ‘Thank you for coming to my party’. They are perfect for a girls birthday, Pamper Party or Princess Birthday.